536 plants in 100 square meters! Workplace and Florabo after the implementation of the greenest office in Nordea in Gdynia, once again created an extremely green zone. This time there is even more plants in a smaller space. 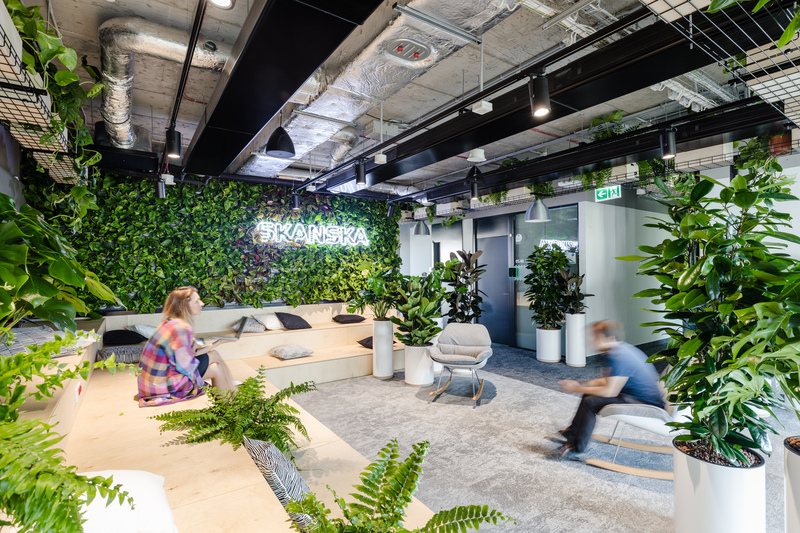 Skanska created a common space for employees in its new headquarters in Poland. 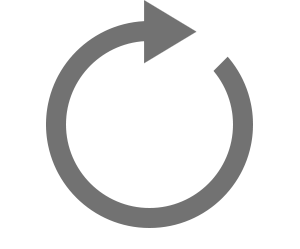 The company wanted it to be possible to meet in a large group for a town hall meeting or to work in silence. 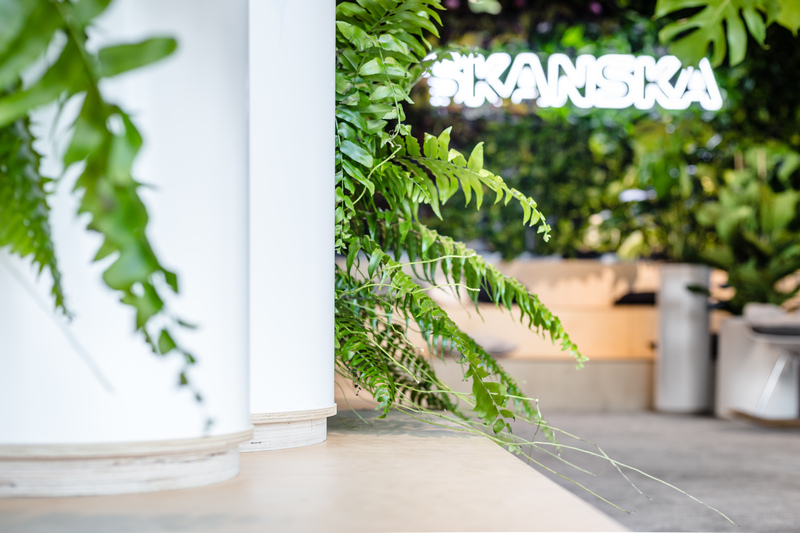 In Skanska’s origin, the construction of sustainable work environments is the main objective, so it was to be assumed that the project brief would reflect that. The space was supposed to emanate the character of Skanska, Scandinavian openness and attitudes towards human-centered approach. Common idea with Skanska named “Green Amphitheater, naturally!” was developed with active participation of employees. 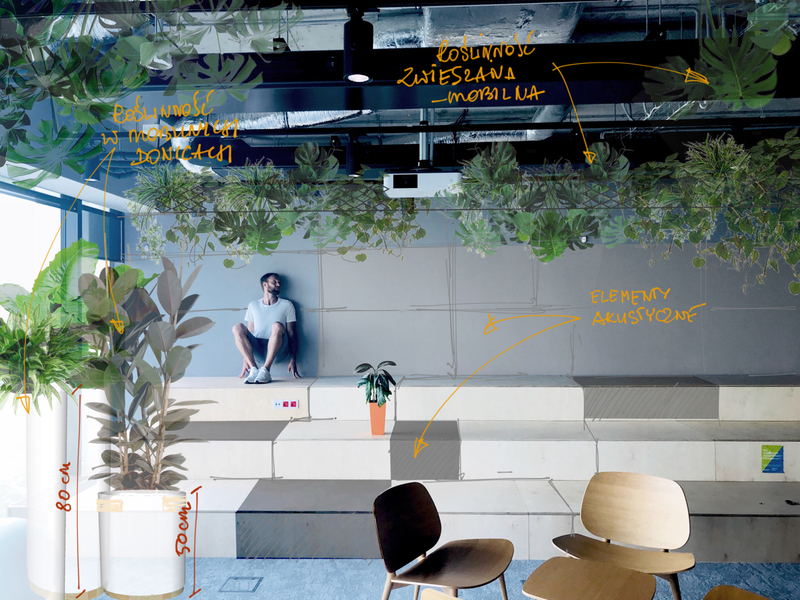 We wanted to create once again the “biosphere” in the office, which allows you to feel like one is in nature. Everyone likes to sit in the park sometimes. We wanted to achieve such an effect and the feelings associated with it in this space. Florabo could be the only suitable partner as they have more green blood in their veins than anyone else. 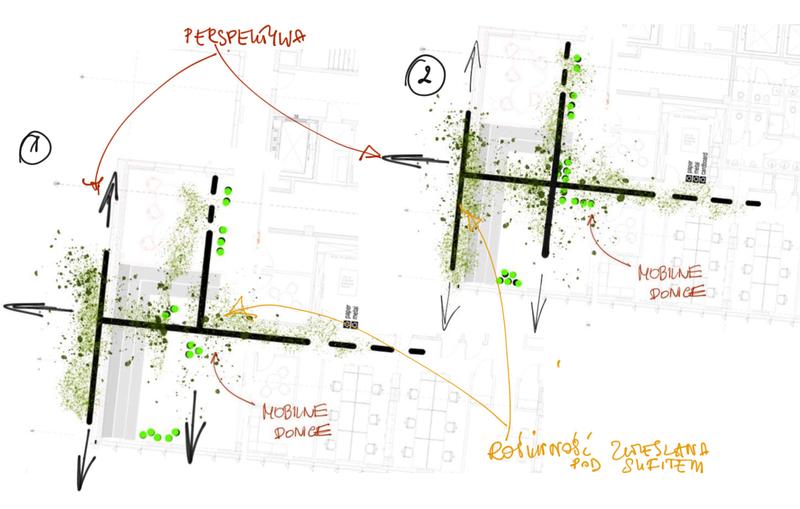 Bogusz and Halina Kamińska from Florabo during brainstorming about the space, decided that greenery should “spill out” from the space into the corridor by hanging from the ceiling. In nature, green reaches in search of water and light. 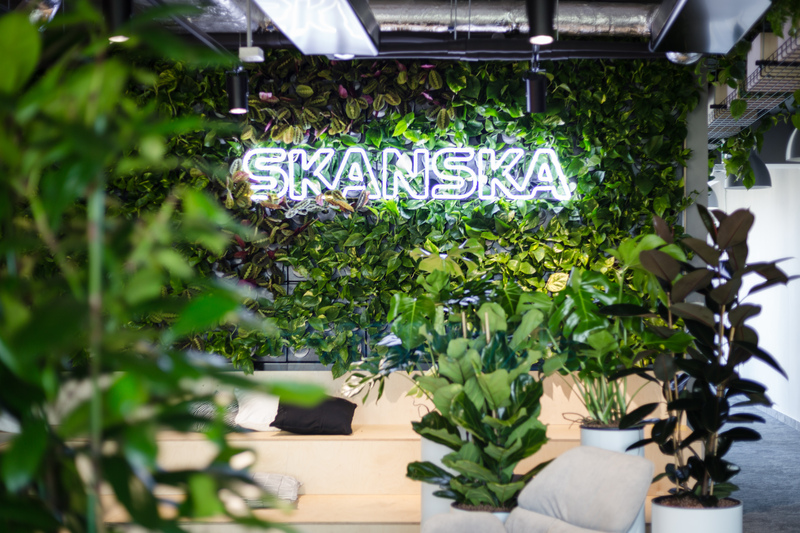 In Skanska, greenery enters the space of communication to connect and relax people. They wanted to achieve this effect and succeeded! How many plants can be found in space? 120 plants hang from the ceiling, suspended in their pots. 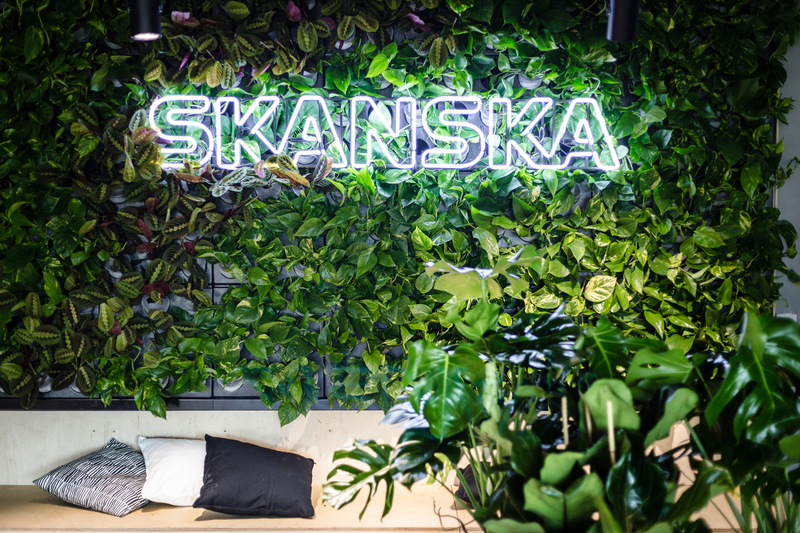 The entire climate has been complemented by the Skanska neon, which emerges from the green wall. It energetically raises the character of space and the company itself. We also made sure that the room had better acoustics by placing sound absorbing material on one of the walls which you can also rest upon. The space is also equipped with comfortable mobile furniture and pillows. Magdalena Mirosz and Magdalena Gumieniak from Skanska have greatly contributed to the project with development, promotion of the idea among the employees, and finally making things happen.